This was the month of starting and then giving up on books. Even though I'm a fan of quitting (it's one of my reading rules), it's still a bummer when I realize that the book's not getting any better. Ape: Author, Publisher, Entrepreneur – Everything you need to know to self-publish including laying out your book + making all the different ebook formats. Released, S.J. Pajonas – So good! And I got to interview her here! The Nerdist Way, by Chris Hardwick – This was a Christmas gift from Jay, because it's been on my list for years and we're fans of the Nerdist podcast (the perfect road trip sidekick – something for the radio that we can both agree on). Loved that it was so in line with what I teach, especially the Map Making Guide. Rockabye: From Wild to Child, by Rebecca Woolfe – I love this blogger's voice so when I saw the book at the library, I snatched it up. Quick, easy, entertaining. 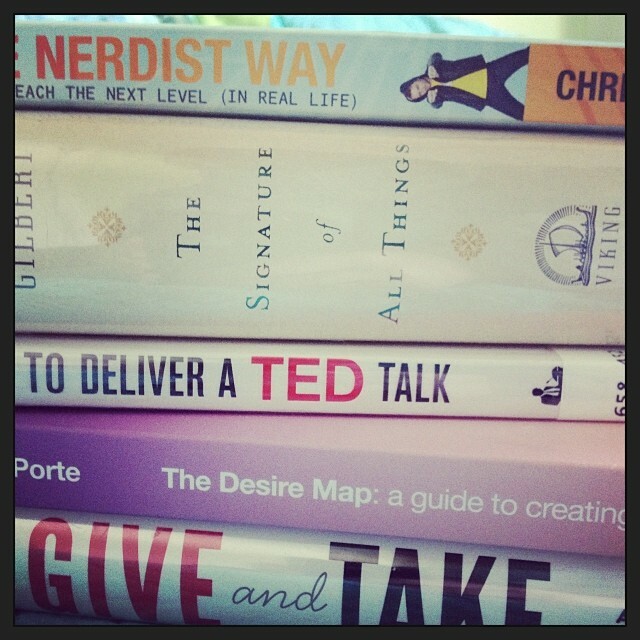 Give and Take, by Adam Grant – Well, I got about halfway through this, then skipped around. I agree with the premise, but all the examples are a bunch of old, corporate white guys who “give” by introducing tech companies to possible investors. This got old, so I decided to give it up. Money: A Love Story, reading up on money in preparation for leading Pay Yourself. No Meat Athlete , nearly finished! Decisive: How to make better choices in life and work. Last year, after writing about reading 100 books in one year, I started sharing what I was reading each month (see them all here). I love that the project brought a lot more conversations about books (and books I never would have discovered) into my life, and I'd like to continue it into the new year, but maybe with a few changes. Do you have suggestions? Do you want me to review my favorite book of the last month (like this)? Share more business books? I'm open to all ideas! Leave a comment here. I follow my enthusiasm by reading…a lot. And once a month, I share (some of) the books I read last month and the books I intend to read this month. 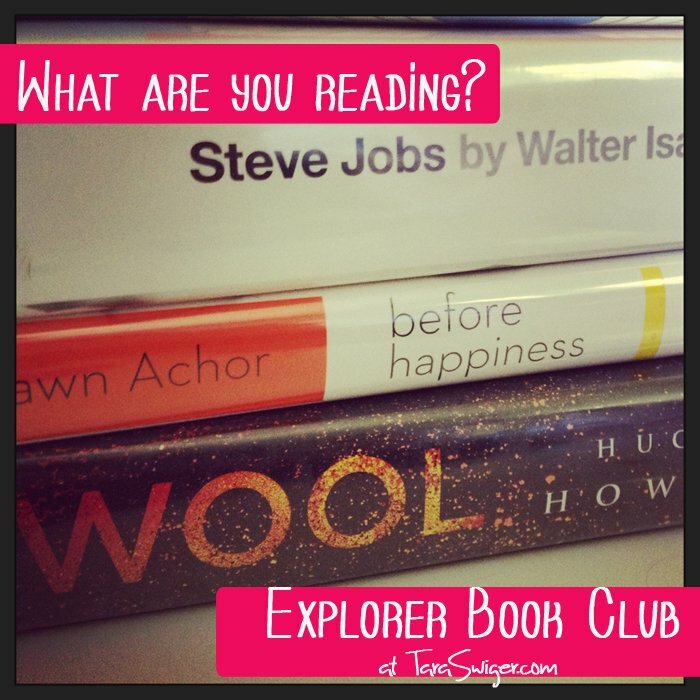 You can join the informal book club by sharing your own list in the comments! I slurped up Erika Lyremark's smart book on the 2nd day of the month! It is a collection of her stories from stripping (yes!) which she transforms into business lessons you can apply to your own work. So inspiring, I read it in one day (and came up with a whole new offering!) Best yet, you can download it free when you join her list! Wool was so, so good. Totally gripping, and totally satisfying. If you liked the Hunger Games or Divergent, you'll love it. I am still taking copious notes on Before Happiness, Shawn Anchor's second book (I read his first one in September). Look for a deeper discussion of his book soon! I happily snagged Paul Jarvis' new book (we talked about it here, remember?) and I can't wait to dive into it. No Meat Athlete covers vegatarianism AND running! What was your favorite book of November? Disclaimer-y Disclaimer! I’m not in any way coerced into saying nice things about anyone's book. Or course I’m biased when my friends write a book, but I don’t mention things I don’t like. Read the usual disclaimer here. Whew! 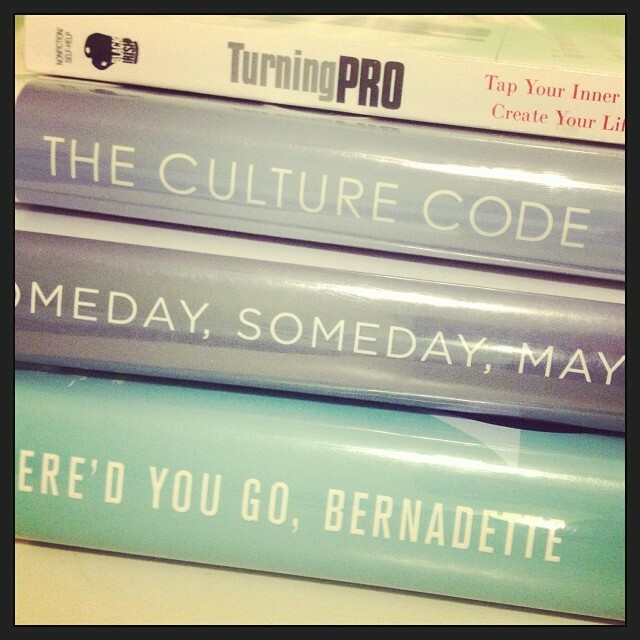 I read quite a bit this month (thanks to all that time in airports + the following Introvert Recovery days). Where'd You Go, Bernadette? Recommended by just about everyone, this was the perfect airplane read! The Art of Being Unmistakable, by Srinivas Rao (podcaster behind BlogcastFM) was a quick, easy, inspiring read. I found myself jotting notes and having ideas constantly during the reading. Have a notebook handy! I got a good start on the ginormous Steve Jobs biography but had to return it to the library about halfway through (he's just made Toy Story with Pixar!). Whenever it comes back in, I'll pick it up again. Turning Pro was fantastically inspiring. I'll probably be writing more about it soon, in the style of this book review. Someday, Someday Maybe. Lauren Graham's novel is funny and tender, and felt a lot like being in my early 20's. Fun + quick! The Culture Code. This was interesting, if a bit reductionist. All the same, it helped me understand a little more about what drives people's buying decisions. I already slurped up Erika Lyremark's smart book on the 2nd day of the month! It is a collection of her stories from stripping (yes!) which she transforms into business lessons you can apply to your own work. So inspiring, I read it in one day (and came up with a whole new offering!) Best yet, you can download it free when you join her list! A carry-over from last month's list, I'm hoping to get to Shawn Achor's second book soon! Wool is the mega-successful self-published sci-fi novel. I've been hearing about it forever and I just started it last night. Gotta read anything with “Wool” in the title, right?! If You Want to Write, by Brenda Ueland is one of my all-time favorite books. I checked it out again to get me through NaNoWriMo. 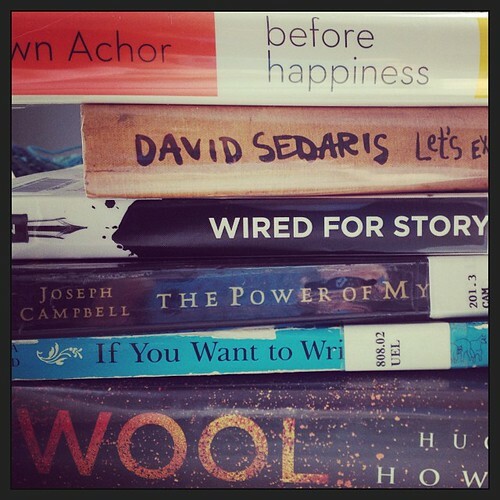 Wired for Story is another writing-fuel book. Allegiant is the third book in the Divergent trilogy and I am on pins + needles waiting for this book to come in for me at the library! What was your favorite book of October? Disclaimer-y Disclaimer! Srini sent me Turning Pro + Erika gifted Think Like A Stripper. But I’m not in any way coerced into saying nice things. Or course I’m biased when my friends write a book, but I don’t mention things I don’t like. Read the usual disclaimer here. I follow my enthusiasm by reading…a lot. 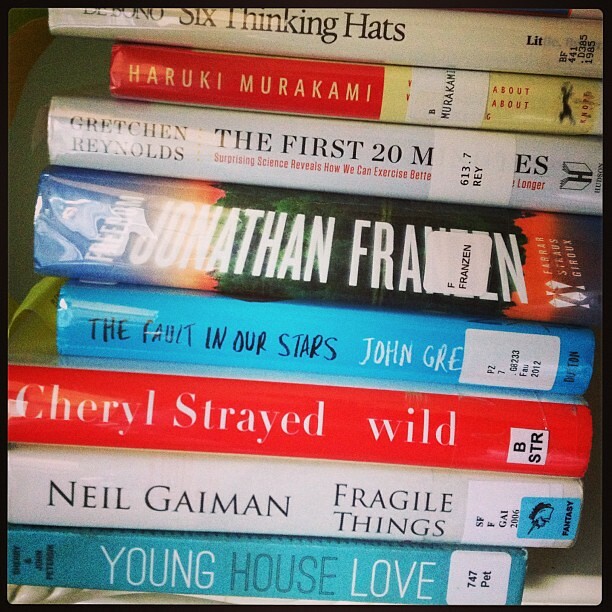 And once a month, I share (some of) the books I read last month and the books I intend to read this month. I'd love to hear about your books – please share your own list in the comments! Stephanie’s new novel, Removed, is so so good. I can't believe I have to wait for book #2! Totally addictive! Use What You’ve Got is a funny mix of personal stories-turned-into-business advice. Hilarious and encouraging, even if you're not a real estate mogul! After watching (and loving) Shawn Achor's TED talk, I put the Happiness Advantage on my list..and I was not disappointed. I've got a whole post on why you're going to love this book (coming soon! ), but if you can't wait, listen to Shawn's great BlogcastFM interview! I liked the Happiness Advantage so much, I added Shawn's second book to my list! Turning Pro was a thank you gift from Srini + it's perfectly purse-sized. 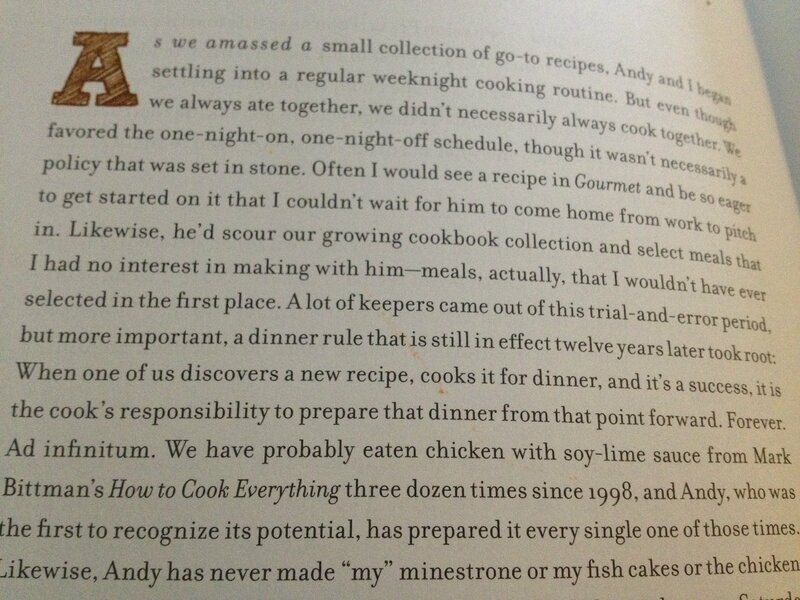 I've been reading it in little blips of time (the chapters are tiny + perfect for bite-size reading) and I already love it! 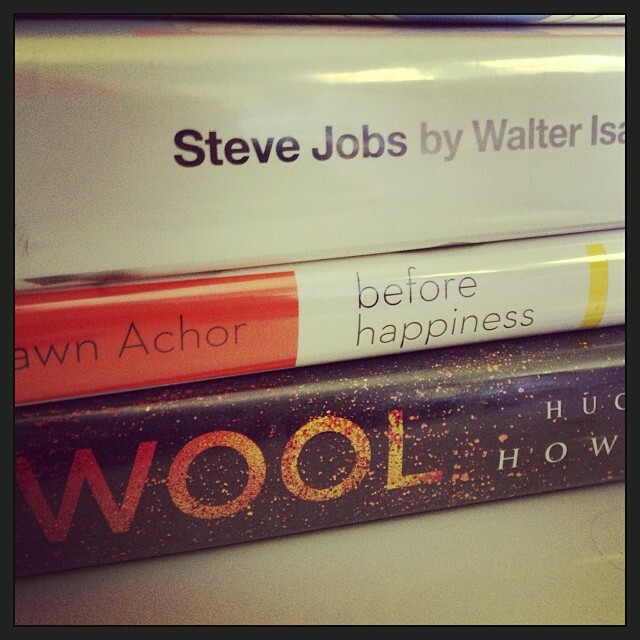 Steve Jobs has been on my list forever and it finally came in for me at the library. The Art of Being Unmistakable, by Srinivas Rao. What was your favorite book of September? Disclaimer-y Disclaimer! I was given a free copy of Stephanie’s book + Srini sent me Turning Pro. But I’m not in any way coerced into saying nice things. Or course I’m biased when my friends write a book, but I don’t mention things I don’t like. (I bought Heather’s book.) Read the usual disclaimer here. Hello book lovers! 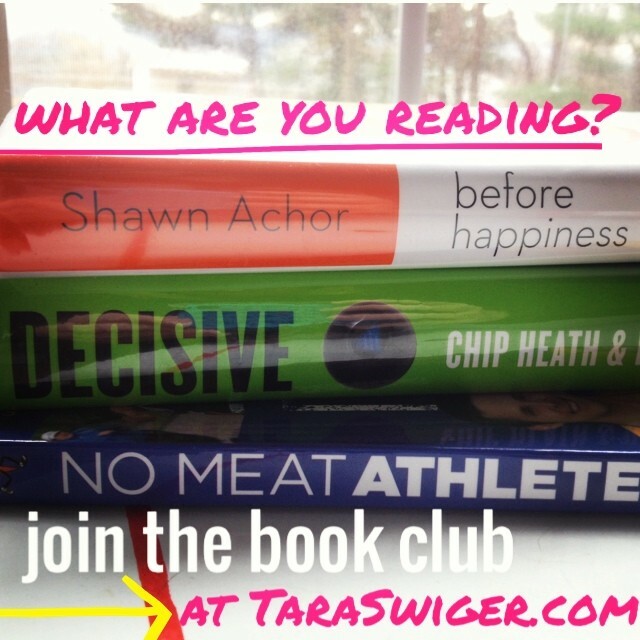 It's time for the book club, but let's change it up! Last month I picked two books, but we didn't have nearly as much participation as the month before, and I think I know why. Two books is just way too limiting, isn't it? I read a few at once, and I'm a fan of quitting whenever I want. So instead of just picking 2 books for us to read and discuss together, let's just make this a space to talk about everything we're reading. I'll share (some of) the books I read last month and the books I intend to read this month. You can share your list of books in the comments, or we can talk about any of the books that you want to read along with me. This book was a big YES to everything I feel about my own creative business, and the way I encourage creatives in their own. It directly inspired this post about the Only Work You Have to Do, whose discussion led to this one on connection…which led to these two posts about creating a path of connection for your customer. I read a lot of quilt books last month, but this was by far the best – both in the I-would-make-that quality of the patterns and in the friendly, chatty beginning. I had intended to read Contagious last month…but I had to return it to the library (someone else had a hold on it) before I got to it. But it's all mine now, and I'm one chapter in. What makes this book different from all the other ones about business and social media is that it is well-researched by the author. You Can't Make This Stuff Up is all about creative nonfiction. What it is, how to write it, and exercises to get you started. Since creative nonfiction is the best definition I can find for what I write, and I'm working on a new project, I'm super excited to read this. After hearing Father Boyle on On Being with Krista Tippet, I wanted to read his book. I strongly recommend the recording of their conversation. It's funny, heart-breaking, and is the very best I can hope for my faith. Lean In. Eh, I'm requested this book from the library because I'm curious about what it says to women in the workforce. I've seen a lot of entrepreneurial types saying “You don't need to “lean in” because you should start your own business!“…but while I'd love for everyone to do exactly what they love, I know that's not a choice everyone has, in every situation. Until I read this, I'm not recommending it, because it has the potential to be completely annoying. I’m an affiliate for Amazon + IndieBound, which means I get soy latte money if you buy through the links I’ve used here. GoodReads is a free tool for tracking what you read. 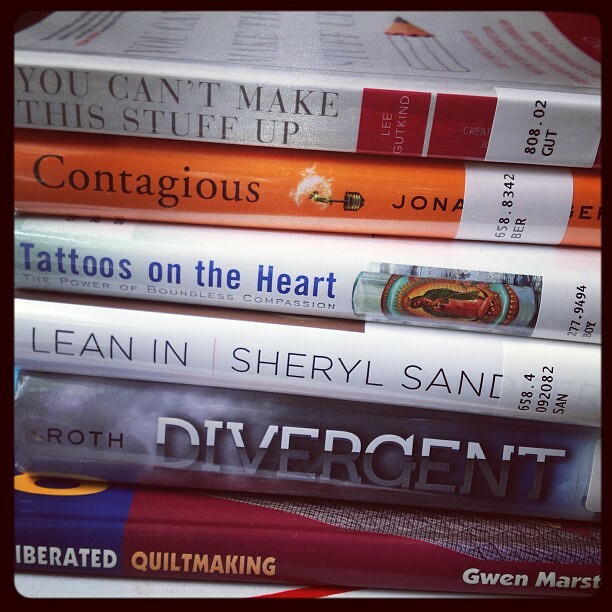 I read all these books via my library, which I strongly recommend! Last month, we started reading The Art of Possibility and Six Thinking Hats. What did you think? Did it change the way you think about making decisions? Leave a comment to tell me. (That's where I'll be sharing how I'm using Six Thinking Hats in my business). Contagious, by Jonah Berger. I haven't read it yet, but it was suggested by Jessica of Storied Yarns and it just came in at my library. I look forward to reading it along with you! *A reminder: I got both of these books at my library – so try yours! If you buy from IndieBound or Amazon using the links below, I get a tiny percentage for soy lattes. If you’re joining me in reading these books this month, say hello in the comments! If not, what are you reading? 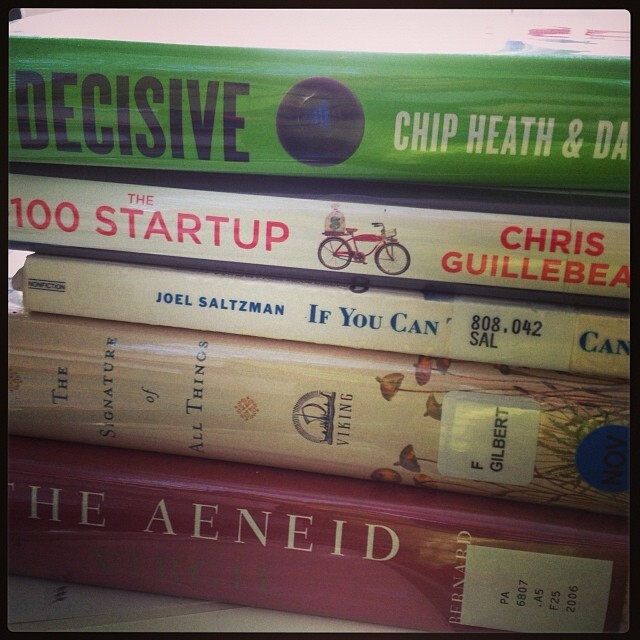 The best of the 100 in 2012 books…and a new Book Club! I am so delighted by your response to the book club idea! Before we jump into it, a few of you have asked over the last year what my favorite books have been, and while I find this oh-so-hard, here are my picks. Each book is linked to it's Goodreads page. Decoded, by Jay Z. Seriously! I could quote this all day. The Bourne Identity – completely different than the movies, but that same kind of action and fun! Zen in the Art of Writing, by Ray Bradbury. – “Like what YOU like!” Indeed! All of the Nora Ephron books. It might be because I watched When Harry Met Sally for the first time when I was 16 on February 14th (after being grounded and missing my first Valentine's Day with a boyfriend), but Nora Ephron is the voice in my head. To get her work is to understand me. Quiet. Whether you think you're introvert or not, you're in some relationship with one. Especially important if your kid might be introverted! Fascinating and encouraging and reading passages out loud to Jay has totally changed the way he understands me, and our relationship. Daring Greatly. 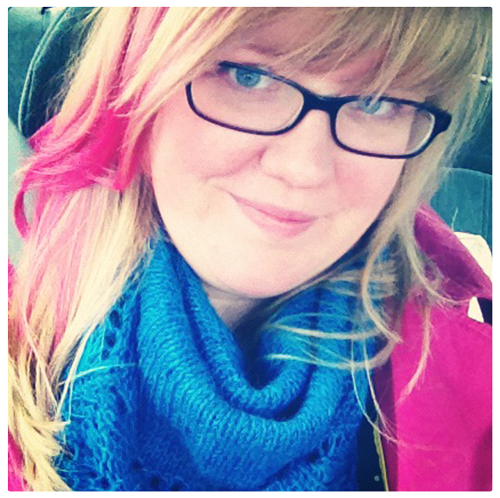 I talked more about why I loved it (and needed it) here. I gave it to my mom for Christmas and want to give a copy to everyone who lives in the world! Please Understand Me: Temperament, Character, and Intelligence. Ignore the lame-o title and read this to understand yourself and your loved ones better. Even if you're not a personality psychology obsessive (like moi), you're going to like it. Another book that I read Jay, leading to epiphanies about everyone we're connected to. I'm an affiliate for Amazon + IndieBound, which means I get soy latte moneye if you buy it through the links I've used here. At the end of the month, I'll open a discussion on the books, both here and on Facebook. You can chime on what you read and if you liked it, or suggest other books we might like to read. 6 Thinking Hats, by Edward DeBono. It's an old-school business book (from the 80's!) but has a great system for making decisions or thinking through possibilities (an absolute must-have skill for an entrepreneur.) I just finished it this morning! If you're joining me in reading these two books this month, say hello in the comments! If not, what are you reading? *This low key approach is inspired by Gretchen Rubin's book club. If you like reading about happiness, you can join hers here.